Cruises are more popular than ever. 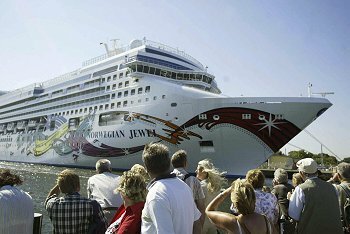 For over 20 consecutive years, the global cruise industry has grown by more than eight percent annually. That is staggering exponential growth. Every year, tens of millions worldwide enjoy what many believe to be a dream vacation. There are many reasons why. Cruisers tend to be high achievers, and on average make more money than the average non-cruiser. The median household income for a cruiser is $104,000. Fully 57 percent have full-time jobs, 16 percent are retired, and well over half are college or university graduates. So what do they know that the rest of the world doesn't? Cruises are fun. Cruises offer great value. Cruises provide an opportunity to visit world-famous destinations that some would never be able to afford if they had to pay for the food, transportation and accommodations separately. People always ask me what my favorite cruise is. It is a fair question but it is akin to asking a parent who their favorite child is. I've been fortunate to have traveled all over the world on countless vessels on numerous cruise lines. I love the British Isles, Europe, the Mediterranean, Asia, Australia, Alaska, the Hawaiian Islands, the Caribbean, the Mexican Riviera, and so much more. But if you forced me to pick just one, then it would be French Polynesia. A lot of people may have heard of French Polynesia, yet not know a lot about it. It is paradise and arguably one of the most beautiful places in the world. Have you ever seen an exotic location in a travel brochure, but when you arrived, it did not quite look the picture? You will not have that problem with French Polynesia. In fact, the only challenge you may have is that your camera's memory card may fill up too quickly. Princess Cruises has a ship, the Tahitian Princess, which offers French Polynesian cruises year-round. They normally begin in Papeete, Tahiti. Papeete is in the Southeast Pacific Ocean. By plane, it is approximately five hours from New Zealand, or eight hours from Los Angeles. International law should dictate that all citizens of Earth must visit French Polynesia at least once. While you are there, it seems as though every island is better than the one you visited the day before. Bora Bora, Raiatea, Rangiroa, Nuku Hiva (Marquesas Islands), Moorea, Rarotongo (Cook Islands - New Zealand), and more. These ports of call are more breathtaking than their names are exotic. How much would it cost to stay in a hotel on just one of these islands? You can use a search engine to look up "The Hotel Bora Bora" to find out. I made the mistake of ordering a cheeseburger on the island of Bora Bora. It was purchased at a very modest, yet delightful café. Before gratuity it was $14.00, without chips! There are three things that I should have remembered: always take the exchange rate into account; things are just more expensive in French Polynesia; and I could have enjoyed a delicious lunch on the ship for free. Had I decided to explore the French Polynesian islands on my own, and not on a cruise, it may have cost four to five times as much. After you factor in the cost of planes, ferry rides, accommodations, vehicles, and food, it is obvious why a cruise is the most logical choice. Cruises are also relaxing. I still chuckle when people tell me that the reason they cruise is because it allows them the opportunity not to think. I hear that a lot. But it is true. After you embark the vessel and unpack, your biggest decision is how to rest. On a cruise, you are fed and entertained, and someone else cleans your room. It sounds basic, but isn't that what we really want when we go on holiday? We all work longer hours now than in previous years. PDAs and mobile phones control many of our lives. So when we are on vacation, we need to relax. You may be pleased to learn that your electronic handcuff won't work on Bora Bora. Have you ever noticed how many different cruise lines there are? Why do you think that is? It is because many smart people realize that cruises are a unique and affordable way to experience the world. Our planet is vast and spectacularly beautiful. We sometimes forget that most of it is water. The capital of Alaska is Juneau, and you can't get to it by car. If you have never cruised before, then why not? All demographics cruise. You can find last minute specials on two-day cruises that are less than what you would pay to survive on land. Literally. Many positive improvements have greatly enhanced the cruise experience over the years. You can dine at a table for two now, and with advancements like "any time dining" — no one tells you when you have to eat dinner. On certain cruise lines, the shows are better than what you might see in London, New York, or Las Vegas. If you don't care about what your room looks like and want to save money, then get an "inside cabin" with no window. They are perfectly fine. Or you can have a balcony suite with your own private hot tub. A cruise is like a hotel. You decide how many perks you want. You will also find exemplary child-care services on many cruises. Some cater to an older crowd, but more than a few epitomize a college student's wildest dream. Most cruises exhibit a wonderful mix of age and ethnicity. If your net worth is higher than a small country's gross domestic product, there are cruises for you, too. These luxurious cruises are more like the yachts you are used to, but on a cruise, you don't have to think. It is nice not having to worry about your yacht getting scratched. I was on a cruise once and a famous Royal Family was on board for the week. These were individuals who could have paid cash for the entire cruise company, yet here they were at the buffet. It turns out that the nightclub on a "regular" cruise ship is more fun than the one on their super-yacht. That is one of the reasons why they decided to hang out with the commoners. They wanted to have fun. They liked the spa, the fine art auctions, the casino, and the fitness center too. What about the Internet and satellite telephone calls? They are in your room now. Some ships even have high speed wireless access in your room. Regular mobile phone service, and outstanding business centers are also the norm. Thankfully, there are some places in the world where even satellites don't work. When your ship is in those areas, then your only option is to forget about your inbox. Yes, a cruise can literally force you to take it easy. Don't worry, you will soon be back in satellite range. World travel, affordable prices, massive convenience, relaxation and fun. That's why I cruise. Paul Durante, a preeminent expert in the cruise industry, has traveled the world aboard cruise ships.